Ingredients: Organic whole-grain oat flour, cocoa powder, organic maple syrup, fruit syrup(apple,peach,and pear), unsweetened applesauce, organic silken tofu, potato starch, baking soda, aluminum-free baking powder, tapioca flour, cinnamon, pure vanilla. Frosting: Organic silken tofu, chocolate chips (dairy-free and barley malt-sweetened), organic maple syrup, pure vanilla. *Gluten-free: Organic brown rice flour replaces oat. Organic chocolate chips sweetened w/organic cane syrup are used (no barley malt). **Diabetic-friendly: Organic birch sweetener replaces agave syrup and maple syrup. The cake is flawless and that's coming from sugar eaters. 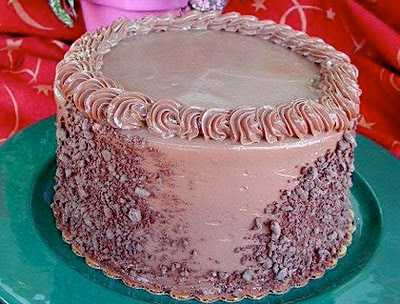 Very most and decadent, is how I would describe the cake. My mother who just tried a bite and loved it (she hates cakes that don't have sugar in it but loves this one and thinks it's beautiful), is wondering how you got it to rise without sugar? I'm curious as to your binding agent. I'm sure it's the apple sauce. Thank you for a wonderful tasty cake. You made my son birthday so special. Thank you for accommodating all our special allergy need. You are great!! !